If you happen to follow my Twitter feed or watch the news much, you will note an impassioned plea by Rev. Al and the Martin family for peace on the 20th anniversary of the L.A. race riots. In my opinion, there wouldn't be such an urgent need to plea for peace if this case hadn't been inflated into some big race issue by Rev. 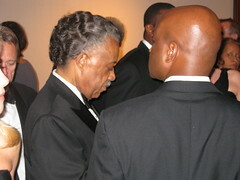 Sharpton and other [possibly] publicity-seeking folks. Whether he intended it to be this way or not, it has evolved into an ugly situation. I am extremely disappointed in the way this was "racially profiled" by the mainstream media and labelled by some as a hate crime before Zimmerman has even had a chance for a fair trial (which will be tougher than ever now). I hope that we, as a country, can learn some valuable lessons from this, as to prevent this unnecessary heightened level of emotion and subsequently racially-charged atmosphere that now surrounds this case from happening again. I want to believe that Rev. Sharpton's intentions are legitimate and he really wants to see justice done and nothing more, but have to wonder when he makes such outcries for justice -when he really doesn't know for sure what that justice should mean. What if justice means that Zimmerman is found not guilty? I am not saying that he is not guilty and I suspect that his actions led, at least in part, to the death of Trayvon -- simple because he failed to heed the 911 person's request not to pursue him. Now that the case has more than garnered a huge amount of national attention, acts of violence are being committed and the name Trayvon has been invoked in some of these cases as innocent victims are severely beaten. Yet, in all of this, I don't hear Rev. Al making headlines screaming for justice in those cases. Rev. Sharpton is considered to be an honorable, caring man by many whose opinions I respect, such as Rev. Jackson's daughter Santita. Recently hired by fox News as a contributor, I saw her on the O'Reilly factor one evening defending Rev. Sharpton's integrity. I really like and respect this lady and will give her opinion some merit in considering everything been said and written around Sharpton and the Martin case. But still, I have to wonder. I have seen no evidence (other than shamefully-tampered recordings) to indicate that this was a racially-motivated killing. I won't say that it was or was not -- because I do not have access to all the facts in this case; nor do any of the news networks that seem to feel they have the right to be judge and jury in this matter know for certain what happened. I no longer watch MSNBC because, in my opinion, their journalistic integrity has been rightfully called into question and I find some of the comments made by some of their hosts despicable. I'll wrap this post up by writing this: I believe that these cases of violence toward white people that are sporadically happening in Trayvon's name around the country are nothing more than cowardly outpourings of hatred and frustration that have nothing to do with "justice for Trayvon" -or justice for anybody, for that matter. They would have occurred anyway; Trayvon's killing created a convenient excuse and way for some people to try to reconcile their conscience around deplorable acts.